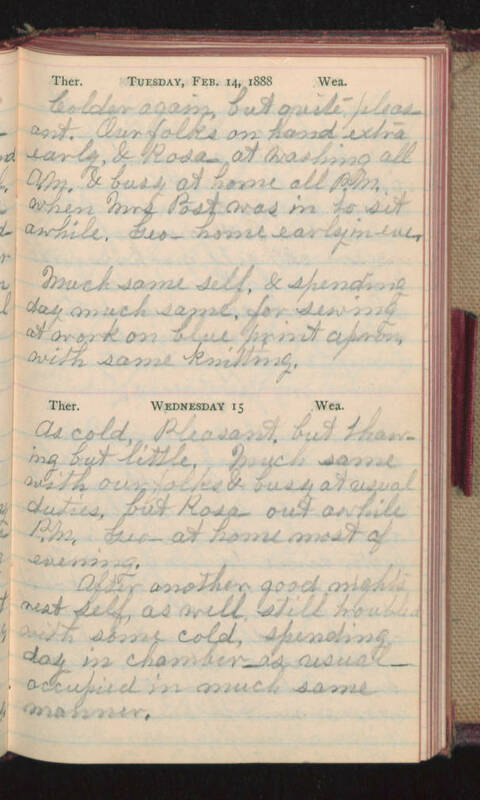 Tuesday, Feb 14, 1888 Colder again, but quite pleasant. Our folks on hand extra early, & Rosa- at washing all A.M. & busy at home all P.M. when Mrs. Post was in to sit awhile. Geo home early in eve. Much same self, & spending day much same, for sewing at work on blue print apron with some knitting. Wednesday 15 As cold, pleasant, but thawing but little. Much same with our folks & busy at usual duties, but Rosa out awhile P.M. Geo at home most of evening. After another good nights rest self, as well still troubles with some cold, spending day in chamber as usual occupied in much same manner.